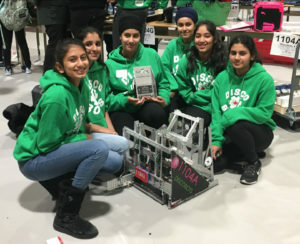 We caught up with Jasmeen of VEX Robotics Competition Team 1104A of Brampton Robotics to hear about her first year in robotics and how a visit to VEX Worlds inspired her to join a robotics team. After attending VEX Worlds 2016 as a spectator with her brother’s team and volunteering at the event, Jasmeen was hooked and knew she wanted to join a VRC team of her own. Jasmeen was especially inspired by Debbie Sterling, the founder and CEO of GoldieBlox, who was inducted into the STEM Hero Hall of Fame at VEX Worlds 2016. “After hearing her speech at VEX Worlds, I decided to join a robotics team and do something which I enjoyed.” Jasmeen inspired her friends as well and encouraged them all to join her on an all-girls VEX Robotics Competition team, which is the first of its kind in Brampton. Jasmeen is now the team captain of 1104A and also assists with many aspects of the team such as building the robot, marketing and financing the team, and working with the media. Creating her first working robot was the highlight of her season. “It felt as if we just gave life to a piece of metal,” she said. Jasmeen is inspired by the varied robot designs out there. “In modern day technology, it is all about design and the way something looks. I want to be able to create something which completes a task efficiently yet looks great,” said Jasmeen. Jasmeen also keeps busy with many extracurricular activities. “I figure skate and play the violin. I am also a member of my schools’ Student Activity Council, Athletic Council, Music Council, and Interact Team,” she added. As for the future, Jasmeen plans to go into the medical field and eventually become a surgeon. It was a pleasure learning more about Jasmeen and how she got her start with robotics and team 1104A!